WTTW, Chicago's premiere public television station, will broadcast Typeface at 10 pm on Friday, August 5th as part of a year-long series honoring our 50th anniversary. This special broadcast of the Emmy nominated documentary Typeface takes place seven years after the film first premiered, a long seven years that have seen the story of The Hamilton Wood Type & Printing Museum go through many further twists and turns. Debuting in 2009 as the opening event at Typecon and playing to rave reviews at film festivals across the world such as the Flyway Film Festival, where it won Best Documentary, Typeface depicts the story of a museum in a little town in Wisconsin where a small group of people are not only trying to preserve the history of letterpress and wood block printing, but also are trying to revitalize it for a new millineum and a new generation. Director Justine Nagan, Kartemquin's own former Executive Director, made her film after a chance visit to the Hamilton Museum on her way back from a wedding, saying, "once inside, I was just blown away by the collection and the space and I thought—this should be documented." Justine's exposure to Hamilton was not an atypical experience as, being nestled away in Two Rivers, Wisconsin, the Wood Type Museum did not see many visitors for a good number of years, making less money annually than the ice cream parlor next door. However, the director of the museum, Greg Corrigan, still comes in every day and turns the lights on in this massive industrial warehouse that now doubles as museum and workplace for those who keep the art of letterpress alive such as woodblock artist Dennis Ichiyama, print shops such as that of the Moran brothers, and art collectives such as the Chicago based typography collective The Post Family. One weekend each month, the quiet of Two Rivers is interrupted as carloads of these artisans drive in from across the Midwest. The place comes alive as printmaking workshops led by, and filled with, some of the nation's top design talent descend on the sleepy enclave. 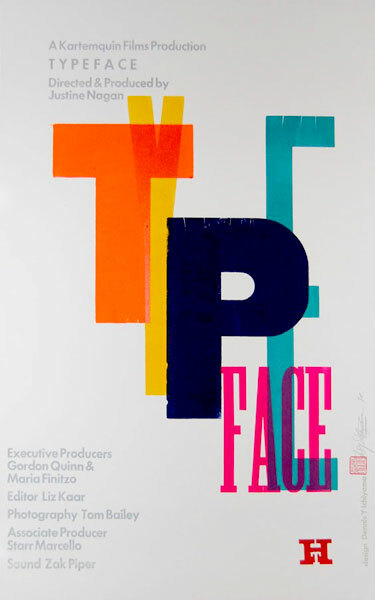 The film navigates the difficulties presented by the changing media landscape and the digital marketing world which has been rapidly making letterpress and woodblock printing obsolete outside of small pockets of preservation like the museum. At the same time, the museum has to deal with the repercussions of the 2008 Financial Crisis which makes tourists even more unlikely to make the trek out to Two Rivers. The film also questions what is the responsibility of these artists and historians to preserve a dying craft, and also how rural towns can survive in a shifting industrial marketplace where big-box retailers and globalization are king. Typeface recently had a screening at The University of Chicago's Doc Films as a part of their Kartemquin Summer Series in honor of our 50th anniversary. After the screening, Dennis Ichiyama, Bob Zeni (of the Society of Typographic Arts, and Associate Producer of the film Starr Marcello had a discussion and a Q&A about the state of the typographic community and the Hamilton Museum seven years after the film debuted. They were all happy to report that, while the museum has moved out of its original location, it has been flourishing under the direction of new director Jim Moran and has experienced a surge of young artists coming in to learn the trade and experience the history of their medium. For more information on the museum, you can check out their website, peruse through their large offering of workshops, and check out their instagram page to check out the new printings they are making. Other highlights of Kartemquin’s 50th anniversary year include several retrospectives and screenings in Chicago and nationwide; an exhibition; a book; workshops, panels, and master classes; and online streaming of the organization’s entire catalog of award-winning documentaries via http://watch.kartemquin.com. The full calendar, which will be updated throughout the year as new events and partners are added, is available at www.KTQ50.org. Join the conversation on Twitter at @Kartemquin or by using #KTQ50.